Small price tags, big potential gains -- that's the combination we're looking at today. In 2016, some of the most interesting trading setups are showing up in stocks that trade for $10 or less. Those low-priced stocks come with higher volatility -- both up and down. And by filtering out the high-probability upside setups, you can supercharge your portfolio at the same time that the big market averages are hovering around breakeven. Just so we're clear, a low share price doesn't necessarily mean that we're talking about a small company, or even a "cheap" one by valuation standards. In fact, by itself, share price isn't a very useful metric at all. But it's true that lower-priced stocks do tend to trade more actively than pricier stocks of similar market capitalization. And when stocks under $10 start making moves, the gains can be substantial on a percentage basis. 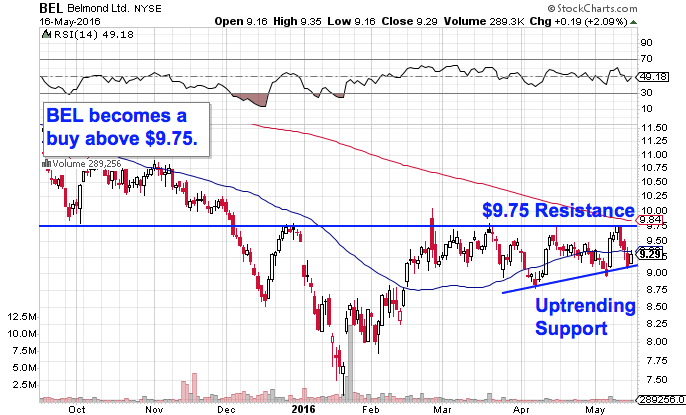 That's why we're taking this technical look at five under-$10 stocks today. Leading things off is Turquoise Hill Resources (TRQ - Get Report) , the $5.7 billion Canadian mining stock. Like other miners, Turquoise Hill has found its share price under pressure in the last year, backsliding more than 35% since this point in 2015. But shares are finally showing signs of a rebound in 2016 -- and a classic technical price setup points to higher ground ahead this spring. Turquoise Hill is currently forming an ascending triangle pattern, a classic technical price setup that's formed by horizontal resistance up above shares at $3, and uptrending support to the downside. Basically, as Turquoise Hill bounces in between those two technically important price levels, shares have been getting squeezed closer and closer to a breakout above our $3 price ceiling. When that happens, we've got our buy signal. 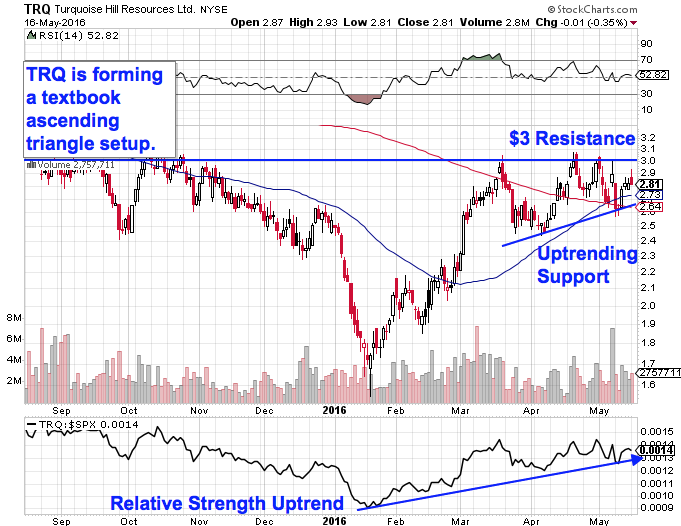 Relative strength adds some extra confidence to the upside chances in shares of Turquoise Hill right now. That's because our relative strength line, which measures TRQ's performance versus the rest of the market, has been holding onto its uptrend since shares bottomed in January. That means this stock is continuing to outperform the rest of the market right now. 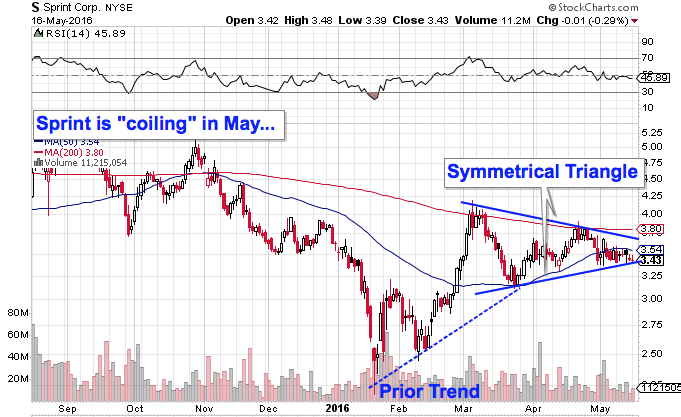 A breakout above $3 makes higher ground the high-probability move in May. Small-cap hotelier Belmond (BEL - Get Report) is showing investors a similar price setup right now. Like Turquoise Hill, this travel stock bottomed back in January, and shares are pointing to the possibility of more upside in May thanks to a pretty textbook ascending triangle pattern. For Belmond, the breakout level to watch is resistance up at $9.75. What's so special about the the $9.75 level? It all comes down to buyers and sellers. Price patterns, such as this ascending triangle setup in Belmond, are a good quick way to identify what's going on in the price action, but they're not the actual reason that makes the stock tradable. Instead, the "why" comes down to basic supply and demand for Belmond's shares themselves. The $9.75 resistance level is a price where there has been an excess of supply of shares; in other words, it's a spot where sellers have been more eager to step in and take gains than buyers have been to buy. That's what makes a breakout above $9.75 so significant -- the move means that buyers are finally strong enough to absorb all of the excess supply above that price level. If Belmond can muster the strength to break above $9.75, it's time to jump onboard with the buyers. After rallying 40% off of its January lows, mobile carrier Sprint (S - Get Report) is showing investors a triangle of a different sort right now. Sprint is currently forming a symmetrical triangle, or "coil" pattern, a setup that's formed by a pair of converging trend lines. Consolidation patterns like the symmetrical triangle are common after big moves -- they give investors a chance to catch their breath and figure out their next step. The buy signal comes on a breakout to the topside of the pattern, currently right at the $3.75 level. If shares can catch a bid above $3.75, then we've got a strong indication that the sideways trading is over and buyers are ready to come back into Sprint. Otherwise, if shares violate support just above $3.25, then Sprint opens up some downside risk. The constricting action of Sprint's symmetrical triangle is setting shares up for a volatility squeeze. Since volatility is cyclical, periods of very low volatility are typically followed up by a swing to high volatility. That means that Sprint's initial move is likely to be very fast -- don't miss it. The first move outside the symmetrical triangle dictates the direction to trade it. The price action is looking a lot more straightforward in shares of $19 billion Colombian energy stock Ecopetrol (EC - Get Report) . Since the calendar flipped to January, this big energy company has been enjoying the combined upside from rebounding energy prices and a slipping U.S. dollar, resulting in a share price that's rallied 36% year-to-date. Don't worry if you've missed that move so far though - Ecopetrol is still a "buy-the-dips stock" in May. 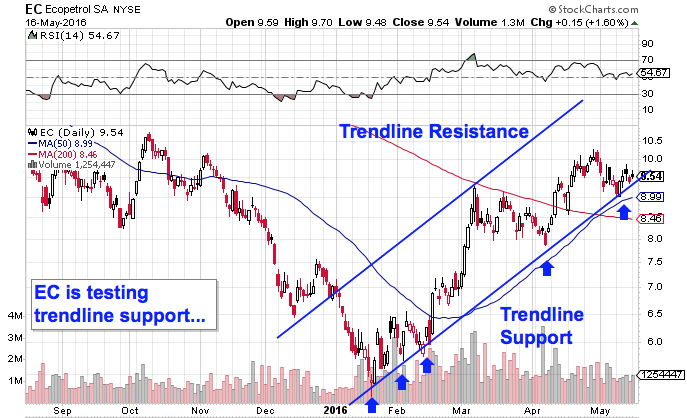 Ecopetrol's price has been making its way higher in an uptrending channel, a simple price setup that's formed by a pair of parallel trendlines that have identified this stock's high-probability range for almost all of 2016. Every test of the bottom of that trend channel so far has given buyers a low-risk, high-reward opportunity to build a position in shares, so as we touch support for the sixth time, the next bounce higher is our buy signal. Waiting for that bounce is important for two key reasons: It's the spot where shares have the most room to move up before they hit resistance, and it's the spot where the risk is the least (because shares have the least room to move lower before the channel breaks, and you know you're wrong). Remember, all trend lines do eventually break, but by actually waiting for a bounce to happen first, you're ensuring Ecopetrol can still catch a bid along that line before you put your money on shares. If you decide to buy that support bounce, the 50-day moving average looks like a good place for buyers to park a stop loss. Last up on our list of sub-$10 stocks is Brazilian pulp and paper producer Fibria Celulose (FBR . The last six months have been pretty awful for Fibria; this $4.5 billion stock had lost almost 40% of its market value since the middle of November. But shares could finally be showing signs of life in 2016 thanks to a classic reversal pattern that's been forming on Fibria's chart since March. 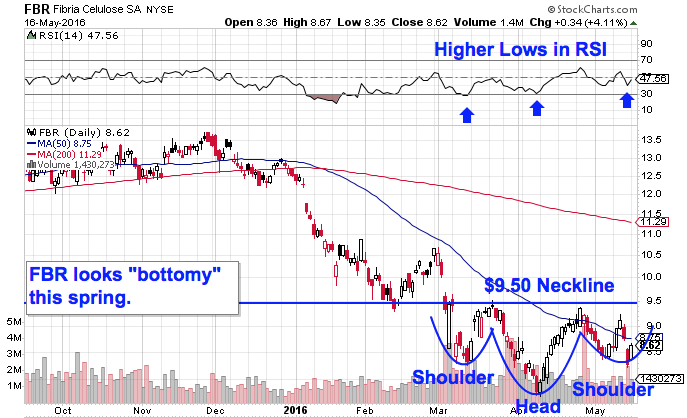 Fibria has been forming an inverse head and shoulders pattern, a price setup that signals exhaustion among sellers. After the selloff that this stock has shown investors in recent months, it's not hard to imagine that sellers are finally getting winded. The inverse head and shoulders is formed by two swing lows that bottom out at approximately the same level (the shoulders), separated by a lower low (the head). The buy signal comes on a move through Fibria's neckline at $9.50, which is the key price level to watch from here. Price momentum, is the indicator to look at in Fibria. 14-day RSI, up at the top of the price chart, made a series of higher lows at the same time its price was bottoming in the inverse head and shoulders pattern. That's a bullish divergence that tells us buying pressure has been quietly building behind the scenes. Once shares can catch a bid above $9.50, Fibria Celulose becomes a high-probability buy.